I am so excited. 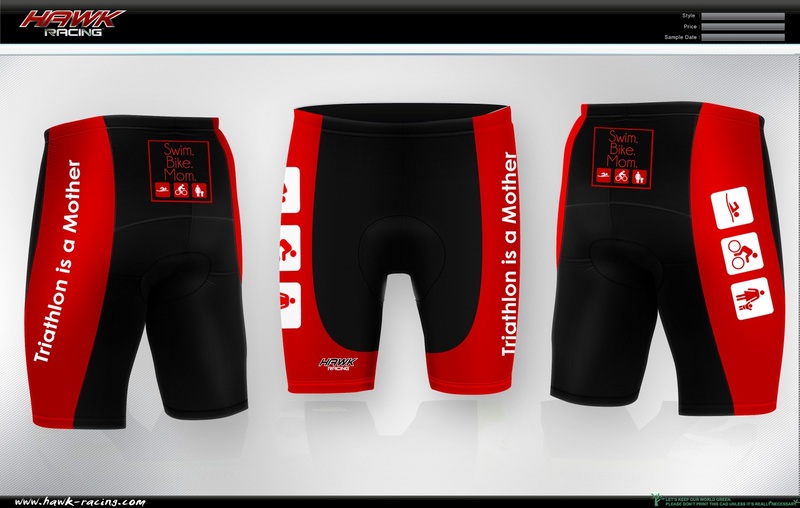 As many of you know, I have been working with Hawk Racing for the design of the SBM tri kits! This is the first “draft” of the shorts. What do you think? I took some suggestions to keep the black to a minimum because of the heat factor. The top will be similar, but flattering through the belly region (like either black panel or something to distract from the belly). At least that’s my plan. Will keep you posted on the tops, and the ordering info once they are complete. I am heading out to San Diego on Thursday to hang out with some SBM friends (who I have never met and am DYING to meet), then meet up with Tanya and Marison from GOTRIbal, and hopefully, Cheryl from the recently launched company, Bia Sport. If you are in San Diego, and want to hang out with a group of fun, triathlon-crazy ladies this coming Thursday and/or Friday night, please send me an email (swimbikemom at gmail.com) and I’ll give you the scoop! Love'em! I think it's just enough black to be flattering and slimming. Great job! Can't wait to order the kit for my post-partum comeback. I'm not cleared for exercise yet, but I'm pleasantly surprised to find that I am itching to get out there! Looking good to me!! Hope you have a great time. I love the shorts! Very nice color combination. I like the shorts! They make me want to TRI! I LOVE the design and the color scheme! One quick question, do you think the decals will stand up to stretching time and again or will they start to peal and crack quickly? That has happened to me in the past with even smaller decals so I am wondering if that would be an issue for the larger ones. Otherwise, I think they are WONDERFUL and can't wait to order a pair when you get everything finalized! I actually have a Getting 2 Tri foundation kit that Hawk Racing designed, and it's not "decal"-y at all. Very cool, lightweight fabric, and comfortable. These are freaking fantastic!! Love them!